The randomly selected winner is comment #7...Debbie! Congrats Debbie. It's always fun to see someone win who is a frequent commenter too. Debbie has encouraged me a lot over the past year. Thanks! She has her own blog too, A Quilter's Table. I've sent the pattern to your email, Debbie. 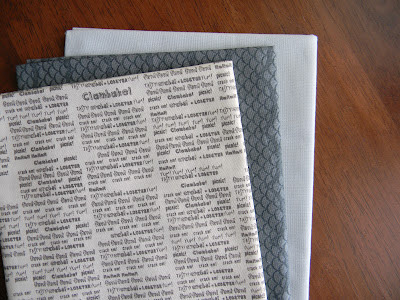 Email me back with your address, and I'll send you the fabric from Fat Quarter Shop. There are still chances to win the pattern. The Fat Quarter Shop is also choosing three more winners of the pattern today, follow them to keep an eye on their twitter feed today. Thanks for entering everyone! 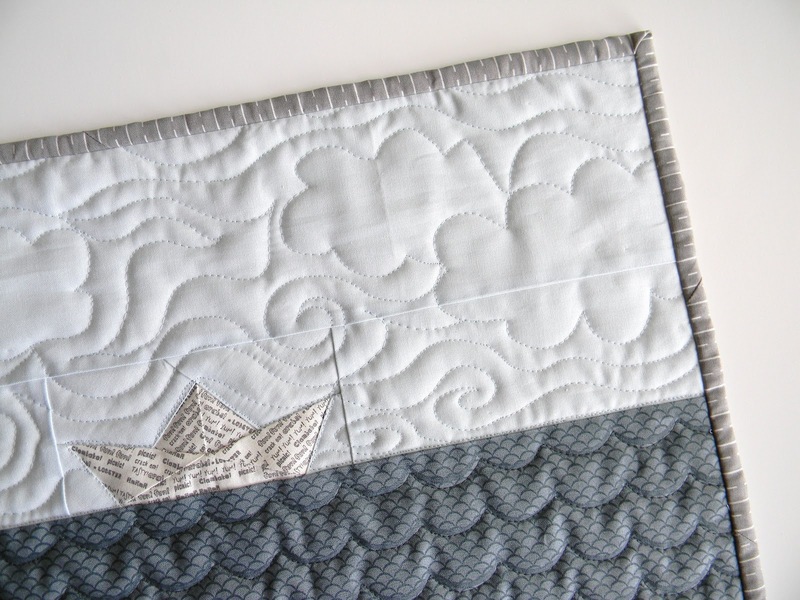 You've seen my first paper boat mini, as well as the baby quilt it inspired. 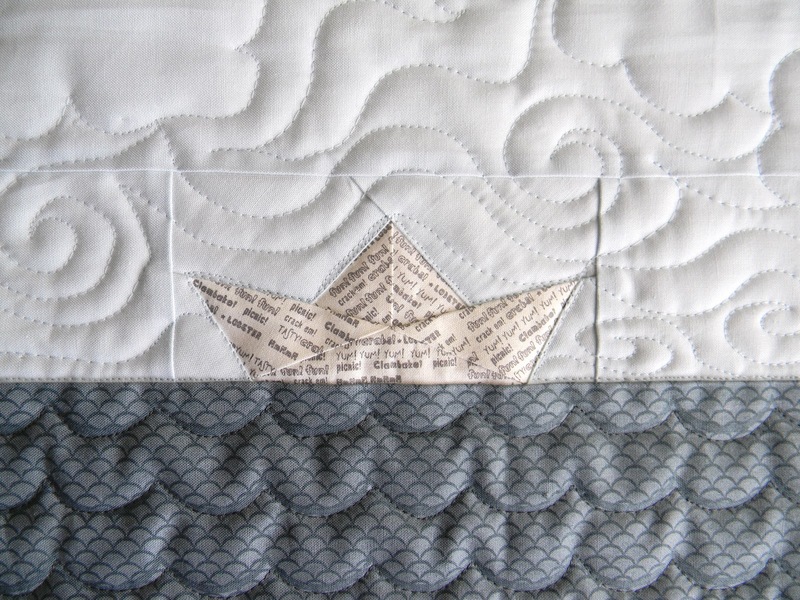 If you recall, I drafted my own paper pieced pattern to create the boat, and now I've written a streamlined pattern for the mini quilt. This whimsical mini quilt is a great accent for a boy's room or a lake/beach house. The pdf pattern is four pages long and includes pictures and illustrations, as well as the paper pieced pattern for the paper boat. I recommend this for sewers with a little paper piecing experience under their belt. 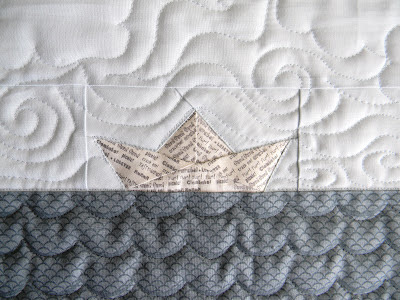 The boat is pretty tiny, as part of a mini quilt (14 x 18.5), and you do need to pay attention to the orientation of the text pints. There is a y seam, but the angle is very gentle. 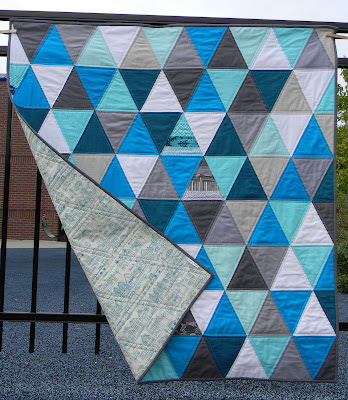 The rest of the quilt is super simple: just four other pieces. 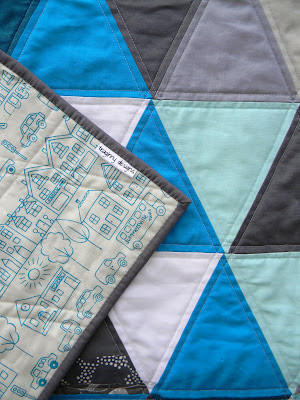 Your can have a lot of fun with the quilting to add a special touch to the wall hanging! I'm excited to add the pattern to my etsy shop. The pattern is now updated to include a baby size version too! I have plans for more patterns to come. For now, I'd like to host a little giveaway. Leave a comment below with a valid email address linked, and I'll draw a random winner Wednesday morning. Giveaway now closed. This is a downloadable pdf pattern, which is perfect for paper pieced patterns. 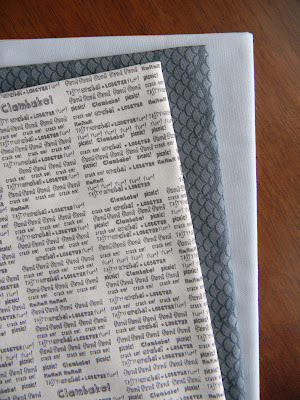 You can easily print out extra patterns as needed, even enlarge it if you like. And guess what else I have to give away? 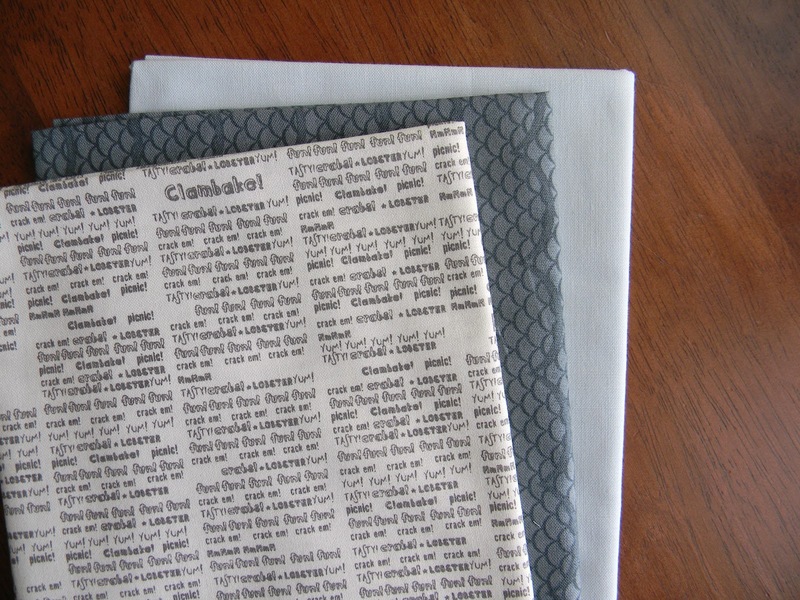 The Fat Quarter Shop was kind enough to send along a trio of fat quarters of the fabrics I used in the mini. They are the text print from Crabtastic, Salt Air's Waves in Ocean and Kona Sky. I love the restful feeling these fabrics. For more chances to win the pattern, hop over to Twitter where the Fat Quarter Shop is giving away the pattern to three more of you. It might be good to keep an eye out for that on Wednesday - hint, hint. Did you notice I just joined Twitter? I'm a little slow to join in social networks, but this one is pretty fun. I like it for the same reason I like texting. It's quick and to the point. I've also found that certain businesses tweet special sales or coupon codes, and if you follow them you're in the know. The Fat Quarter Shop, @FatQuarterShop on Twitter, does this, so there's a tip for the day. Back when I made a whole pile of strip sets, I knew I wanted to try using them in a quilt in the place of regular blocks. I used the Tri-Recs ruler to cut isosceles triangles from the strips sets, as well as from 6.5 inch strips of several solid fabrics. The ruler definitely makes the cutting easy. I worked with aquas, turquoise, white, grays, and one shot cotton. 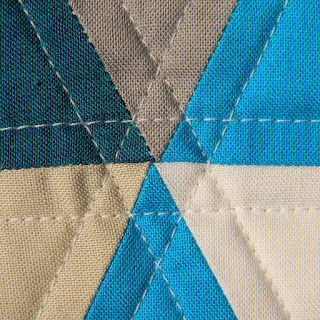 The colors remind me of a cloudy day, with the triangles as raindrops. I used simple straight line quilting a quarter inch from both sides of every seam to accentuate the geometry of this pattern. This results in a cute six pointed star where the triangle points meet. The Summersville print is perfect for backing and adds a whimsical touch to the quilt. Since this is child sized, I didn't want the quilt to be too serious. I also had fun adding an ombre-like strip of solids to the back to make it wide enough. 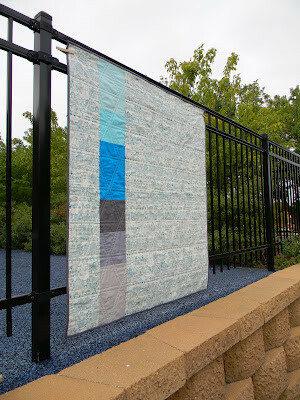 I like it so much, this strip may be the starting point for my next quilt. At 45 x 49, this should be a good lap sized quilt for a boy. 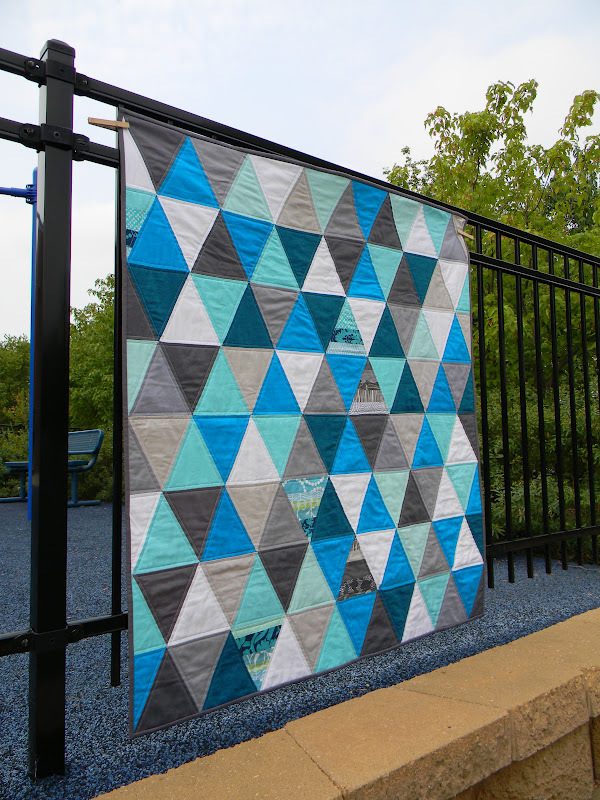 I'm really pleased to have completed five quilts for Project Linus this year and to have met my own goal of making more than one for a boy. 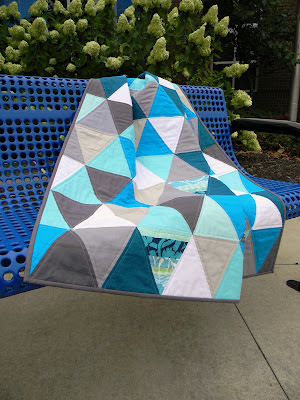 I'm linking up to 100 Quilts for Kids. 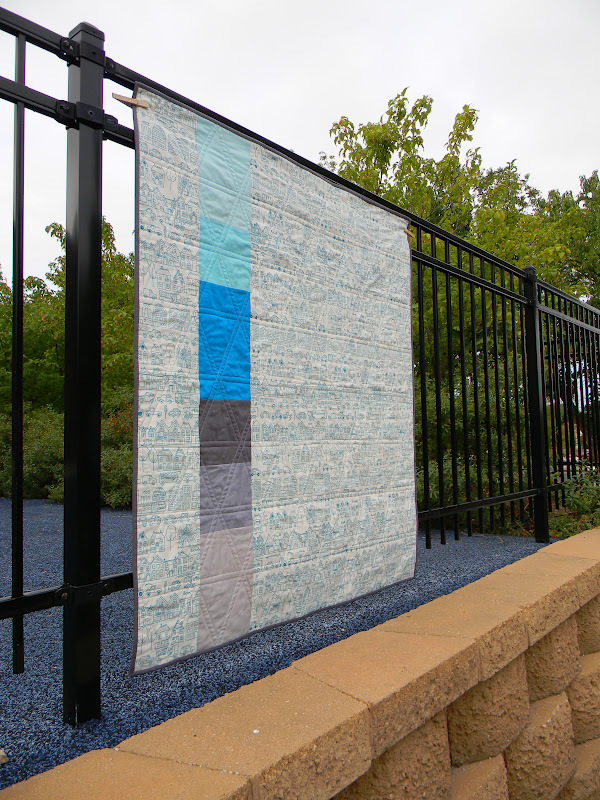 Join in, and donate a quilt locally! I am so blessed to have many super talented friends, many of whom I met through the KCMQG. What can I say? We're stumbling over talented quilters here in the Midwest. 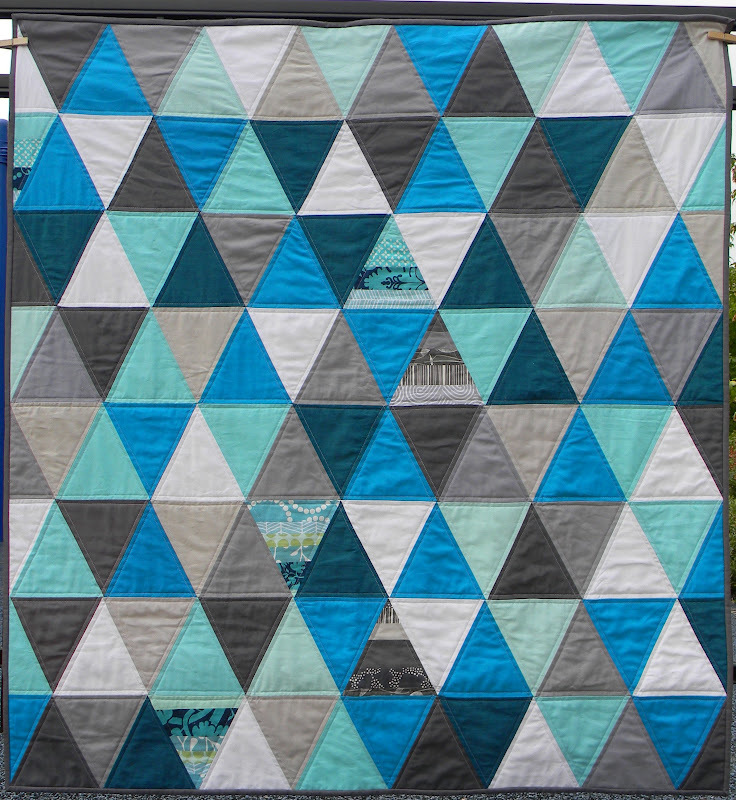 I've mentioned Angela, Lauren, Jacquie, Shea, Vicki, and more, but let me also say that my guild is brimming with a crazy number of amazing quilters whose work isn't shared on the internet. So, join a guild if you can, people! Today I am so excited to share big news from two of my talented friends. 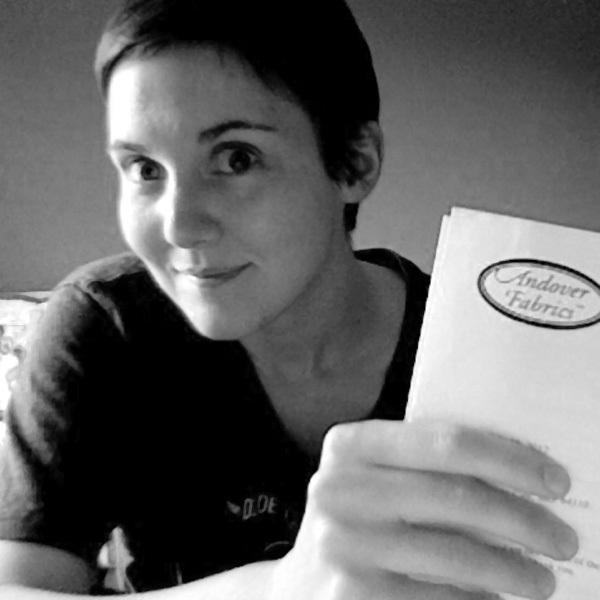 Lauren of Aunt June fame has signed with Andover Fabrics to print her fabric lines! I may have had a sneak peek or two, and let me tell you this stuff is incredible. I can't wait to see it in stores. This fabric will be the product of not only talent but sweat, tears, moneys and of course her unique sense of humor. 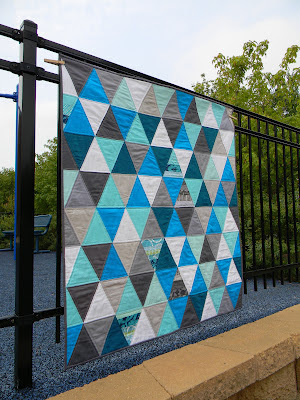 And I have been lucky enough to hear Angela teach on free motion quilting, but now anyone can take a class from her online at Craftsy! Do you see the quilt she's working on in this picture? That's right; it's the one I pieced for her a while back. Check out her blog for a behind the scenes look at the video shoot. Very cool. I'm so proud to know these ladies, and I can tell you personally that they deserve every piece of success that is coming their way.